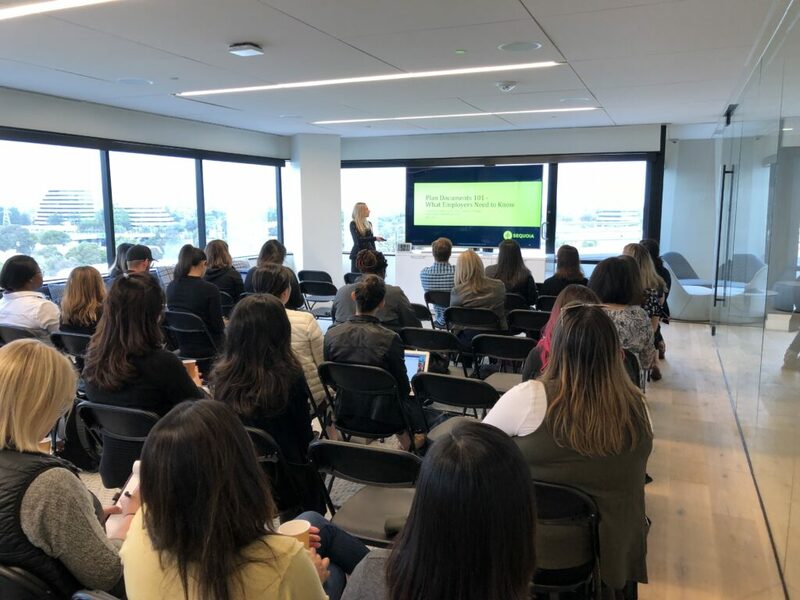 Sequoia hosted two sessions of our annual Compliance Seminar on Tuesday, June 5th in San Francisco and Wednesday, June 6th in San Mateo. Our speakers for the event were Joanna Castillo, Client Compliance Manager at Sequoia Consulting Group, Linda Gulledge, Of Counsel at Fisher Phillips, and Sheldon Blumling, Partner at Fisher Phillips. The topics addressed were: Leave Law, HIPAA, and Plan Documents 101. When employees return from leave and the law requires reinstatement to the same or a comparable position – always a best practice to reinstate them to the same position. FMLA/CFRA/PDL all require group health benefits continuation. Employer has an affirmative duty to enter into an interactive process and provide a reasonable accommodation to a disabled employee or applicant (and disability can be construed broadly). Summary Plan Descriptions (& wrap documents) generally must be provided after employees enroll in the plan (90 days for new plan participants) & the Summary of Benefits & Coverage must be provided before employees enroll (with initial/open enrollment materials). If employer offers pre-tax benefits to employees (including pre-tax premiums, FSA, HSA, HRA, etc.) a written section 125/cafeteria plan document is required. Pre-tax benefits under a cafeteria plan must undergo annual non-discrimination testing before the end of the plan year. Plan participants that do not have regular access to electronic media as an integral part of their job must consent (in writing) before the employer provides health plan documents electronically (this generally includes COBRA, retirees, retail/manufacturing employees). Self-insured health plans (including Flexible Spending Accounts – FSAs) have additional compliance obligations under HIPAA (as compared to fully insured plans which often have limited access to protected health information – PHI). Some of these obligations include: designating a privacy officer, maintaining written policies, providing a Notice of Privacy Practices, and reporting breaches. Employer must obtain authorization for most uses and disclosures of PHI other than those allowable for enrollment tracking, treatment, payment, or health care operations. Self-insured health plans should conduct an annual HIPAA risk assessment. A free risk assessment tool can be found here. Disclaimer: This information is intended for informational purposes only and should not be construed as legal or tax advice. It provides general information and is not intended to encompass all compliance and legal obligations that may be applicable to your specific situation. This information and any questions as to your specific circumstances should be reviewed with your respective legal counsel and/or tax advisor, as we do not provide legal or tax advice. Please note that this information may be subject to change based on legislative changes.